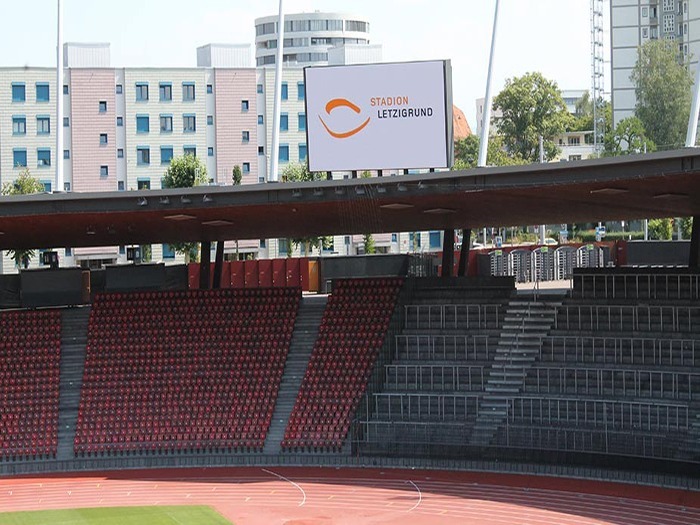 Daktronics installs new LED displays at Letzigrund Stadium. Daktronics has recently been tasked with designing, engineering and installing two new LED video displays for Letzigrund Stadium. The outdoor stadium situated in Zürich, Switzerland has new video features at each end of the field to entertain and inform live event attendees in 2018. “After more than 10 years of use of the very reliable stadium displays, it was time for renewal and upgrade to the latest LED technology to improve the quality of the displays,” said Andreas Bachmann, Process Manager of Facility Management at Letzigrund Stadium. Each display measures 5.85 meters high by 10.61 meters wide and features 13HD pixel layouts to bring excellent image clarity and contrast to fans in every seat of the stadium. The displays incorporate industry-leading environmental protection to ensure optimal operation during any kind of weather. “The new 13HD technology is the first one in the German spoken area and sets a landmark for the opportunities of that technology,” said Rolf Bauer, Daktronics Regional Sales Manager. Each display is capable of variable content zoning allowing each to show one large image or to be divided into multiple sections to show any combination of live video, instant replay, statistics and game information, graphics and animations, and sponsorship messages. Daktronics also included its powerful Show Control System with this installation. This industry-leading system provides a combination of display control software, world-class video processing, data integration and playback hardware that forms a user-friendly production solution. For more information on Show Control.